This document was one of the first items printed in Worcester after Thomas’s arrival in April 1775. It gave a more official account of what had occurred on the day of the Battle of Lexington and Concord. This particular statement from one of King George’s own troops, along with statements from others who had seen the events of the day, proved that the British had indeed fired first. This Narrative was commissioned by the Provincial Congress on May 22, 1775, and Thomas had it ready for distribution in July. Copies were sent to King George, the provincial governors, and other influential personages who may be swayed by its “official” information.2 This was the only official printing Thomas completed for the new Congress. 1. Provincial Congress, A Narrative, of the excursion and ravages of the King's troops under the command of General Gage, on the nineteenth of April, 1775. Together with the depositions taken by order of Congress, to support the truth of it. Published by authority (Worcester: Isaiah Thomas, 1775), 19. (New York: Leo Hart, 1948), 34. 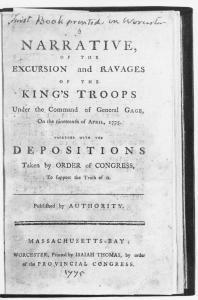 Exact Title: A Narrative, of the excursion and ravages of the King's troops under the command of General Gage, on the nineteenth of April, 1775. : Together with the depositions taken by order of Congress, to support the truth of it. : Published by authority.